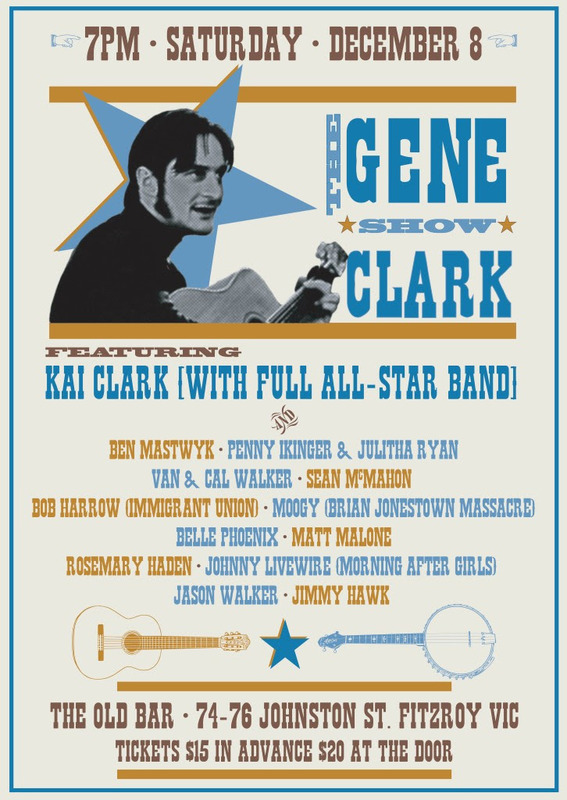 On Saturday 8th December Melbourne musicians will come together with Kai Clark, the son of the great late cosmic folk songwriter Gene Clark to celebrate his incredible legacy at the Old Bar in Fitzroy. Although being the primary songwriter of seminal 60s group the Byrds, Gene Clark’s departure in 1966 (having penned his final tune for the band “Eight Miles High”) to go solo did not bring the commercial success he had previously enjoyed. Since his death in 1991 the legend of his body of solo work has continued to mount. His 1974 record “No Other” is now considered one of the great “lost” albums of the 70s and many artists that have enjoyed commercial success (Tom Petty, Robert Plant & Alison Krauss, The Eagles etc) have covered his songs. Asked to name a song he wish he had written, Bob Dylan answered “For a Spanish Guitar” (from Clark’s 1971 album “White Light”). Kai Clark will be flying in from San Fransico to perform a set of his father’s music at the Old Bar backed by some of Australia’s finest musicians; Ash Davies, Jason Walker, Johnny Livewire, Moogy, Jeff Samin and Layla Fibbins. Also performing Gene Clark’s material on the night some of Melbourne’s most beloved artists: Ben Mastwyk, Penny Ikinger & Julitha Ryan, Van & Cal Walker (with Dave Graney and Clare Moore), Sean McMahon, Bob Harrow (Immigrant Union), Moogy (Brian Jonestown Massacre), Rosemary Haden, Belle Phoenix, Matt Malone, Johnny Livewire (Morning After Girls), Jason Walker and Jimmy Hawk. It’s a night not to be missed for Byrds, Gene Clark and alt-country fans alike.